Save time and money when you buy a complete set of inks. Advanced HP inkjet print cartridge technology gives you consistently outstanding results. Rely on HP for superior quality printing and easy ways to recycle ink cartridges. 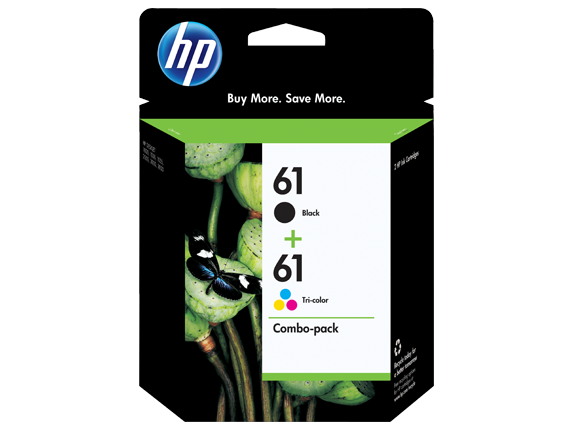 HP 61 2-pack Black/Tri-color Combo Ink Cartridges. Print laser-quality text and vivid color images. Print high-quality documents with laser-quality text and vivid color graphics. Get up to 4 times more black printed pages and up to 3 times more color printed pages, using high-capacity cartridges. Your documents in black and in color will look exceptionally sharp and vibrant – and they’ll remain that way for decades to come without fading.1 It’s another reason to make sure you use the ink that works best with HP printers: Original HP ink.